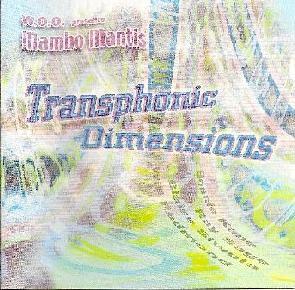 Mambo Mantis - "Transphonic Dimensions" / "+1 -1" / "On A High Note"
From W.O.O. Revelator, to World of Tomorrow, and now Mambo Mantis, New York City based musician Bonnie Kane has been taking free-jazz into exciting territory for years, incorporating rock, psychedelic and other influences into the music. I had the opportunity to see the saxophone/guitar/drums power trio W.O.O. Revelator perform a decade ago at the Strange Daze Space Rock Festival, and World of Tomorrow in the two subsequent years of the same fest, and both bands were electrifying live performers. Mambo Mantis plays a fiery and free-wheeling brand of free-jazz, but can communicate a feeling of rocking out hard, and often utilizes electronics. I've got three CDs from the past year, each with a slightly different lineup, and each offering a little something different from the others. On Transphonic Dimensions the band consists of Bonnie Kane on sax, flute & electronics, Ray Sage on drums, Blaise Siwula on reeds and Will Redmond on guitar & electronics. Recorded in the studio in 2005, the album consists of 11 relatively short, punchy tracks. There's plenty of jamming, but it's all in a tightly controlled framework. The CD opens with "Reggae Sunrise". We've got wailing sax and reeds, and harsh guitar, yet there's still a dreamy quality to the music. Bonnie and Blaise dominate, giving the music a free-jazz style that is accessible and musical. "Like a Dishwasher" is more free-wheeling jamming free-jazz plus wild electronics. Redmond's guitar asserts itself more, contributing a sound that reminds me of what some of the so-called New York Downtown bands were noted for. "China Pang" and "Bleed" are two other free-jazz tracks that incorporate heavy electronics to nicely spaced out effect, especially on "China Pang". "Now the Leg" is a little different, being a frantic and fun free-jazz/new wave rocking tune. "Clouds of Thunder" consists of calm, cool, grooving, free-jazz, but also moments of drone like jazz. "Starts and Stops" is another calm and cool piece, but it's busy busy busy…. shifting directions constantly, keeping the listener off balance. One of my favorites of this set. I liked the brief Blues rocking theme on "Out of the Box". Listeners will quickly understand the title of the track "Zep", with its instantly recognizable Led Zeppelin riff underlying the free-jazz jamming. Bonnie and Blaise wail away to a potent Rock groove on "Sox 1". And on "Sox 2", frenzied horns go psychotic over a steady droning pulse, with it all culminating in an excellent heavy avant-rocking jam. Recorded live in New York City in 2006, +1 -1 is a bit different, consisting of two extended workouts, each creeping up to the half hour mark, plus one short piece. On this outing Bonnie and Blaise are joined by Jordon Schranz on bass and Mike Pride on drums. This album is all about settling in for the long haul, opening up and just exploring, without concern for the limitations of time. The CD opens with the 24 minute "Peeled Patterns". Things build up slowly, much like Bonnie's earlier W.O.O. Revelator work, with howling and moaning horns exploring freely while the drums guide the rhythmic pace. Wild and wooly free-jazz, recalling Coltrane's Ascension, but with nods to Rock. About halfway through Bonnie switches to flute and things briefly take on a more subdued, Beat jazz flavor. Returning to sax, Bonnie and Blaise hold what seems to be a conversation (or debate?). They trade licks, harmonize, cross swords… quite an exchange, with varied and imaginative playing from both. "Tremble and Spin" is a brief free-improv piece that's like a breather between the two lengthy anchor tracks. The 27 minute "Every Day is Perfect" opens with Bonnie playing a flute melody, while Blaise jams alongside, the drums tap steadily, and a rumbling drone shimmers underneath. Bonnie switches to sax just as Pride takes off on drums and the whole band goes nuclear, blaring away in gorgeously chaotic and mercury bursting energy mode. This is a ROCKING brand of free-jazz, with Bonnie and Blaise on dual horns making as much an impact as the best two guitars. The drumming really helps propel the proceedings, and the bass just seems to be playing a secondary role. I can hear it but it's pretty much drowned out by the commanding horns. Later we get some cool electronics that I think sound great with the blaring saxophone. Not a combination you hear every day in a free-jazz context. 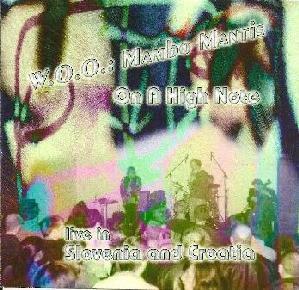 Finally, we have On A High Note, which documents Mambo Mantis' 2005 tour of Slovenia and Croatia. In addition to Bonnie, Blaise, and Ray Sage on drums, filling out the quartet is Pierre Verbeek on cello. If Transphonic Dimensions is about shorter, tighter pieces, and +1 -1 is about lengthy jams that take off and explore, On A High Note is a combination of the two, featuring shorter and longish works. After a short warm-up bit, Mambo Mantis get down to brass tacks with "Time With the Family". From the beginning it's clear that Verbeek isn't just here for string coloring. He's going to assert himself right alongside Bonnie and Blaise while Sage holds down the rhythmic fort. The horn/reed duo do their freaky wailing free-jazz screaming while the cello holds its own, alternately screeching and melodically droning alongside them. Beautiful noise that culminates in an avant-rocking free-improv assault. "Meeting of Minds" is as song like as horn wailing gets. "Electric Love" is like a noise-jazz brand of rock 'n roll. Sage really shines on the drums on "The Card Game", with Verbeek crackling the cello strings. All band members are on fire on the free-jazz and thrash inspired "The View From Here". I love this frenzied eye popping dosed up on something really speedy hell raising. "The Magic Moment" is similar but only slightly more subdued. And rounding out the set is the 16 minute "First Impressions". We've got flute, horn, drums and cello meandering, each in their own individual world… restrained, yet busily pondering. But of course the quartet eventually break out and chaos ensues, in this case with a degree of intensity, due in no small part to the manic but measured drumming. Ray Sage really stands out on this album and showcases what an outstanding drummer he is. At one point we get into a weird noise-jazz ethnic music freakout, but with a doomy edge, dredging up images of some Hasidic wedding party dosed on acid. 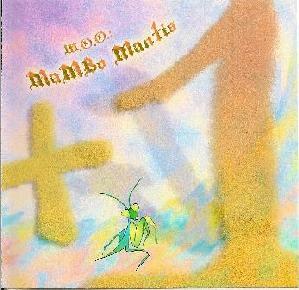 All Mambo Mantis, but differences across these three albums. A real pleasure to get immersed in for a few hours. I'll hold these up to your favorite jamming hard psych album any day.